How to create a unique pillow case with your own words of wisdom! Before taking any bigger decisions in life it is always good to “sleep on it” to let the pro and cons sink in. Today we are making the expression to “sleep on it” come to life in the literary meaning. To make this come true you need a wall hanging from Folklore Company with your customized design and a desire to craft. Today we are crafting a pillowcase. 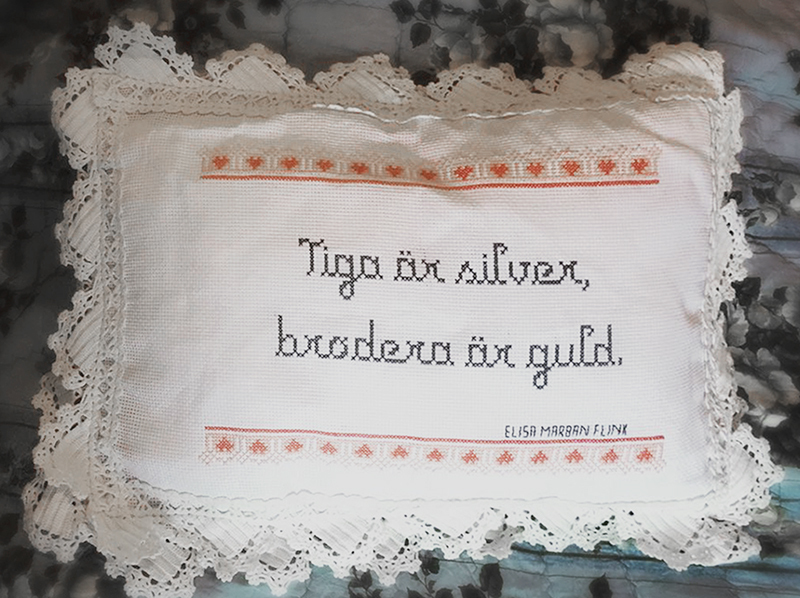 A pillow ( i used a pillow from Ikea 40x60 cm). An embroidered wall hanging from Folklore Company with your design of choice. On our website you can choose the measures/size of your wall hanging (see picture above to get the measurements i have used). A ruler or a tape measure. Fabric of choice for the back of the pillow. Crocheted lace ( can be found in second hand stores). 1. Place the canvas against the fabric you have chosen as the back piece of your pillow. Use the marker to mark the long sides. 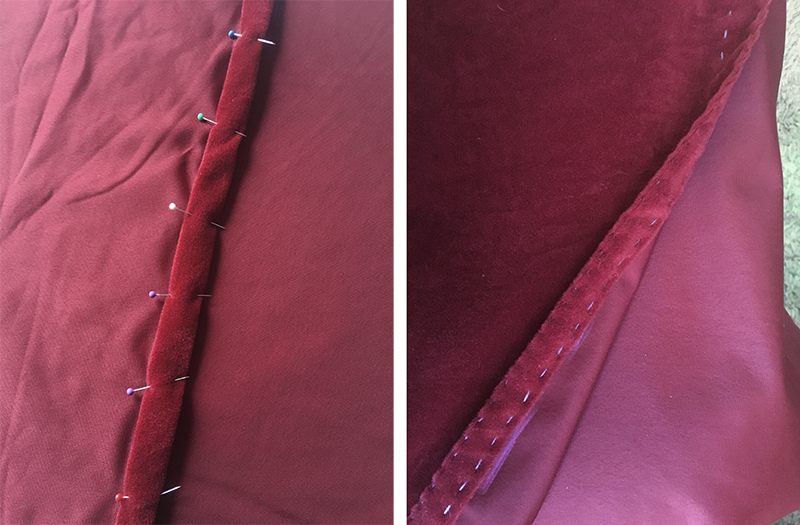 The short sides needs to be 4 cm longer on each side so that you will be able to hem the opening for the pillow case later on. The back piece need to be all together 8 cm longer on the short ends. 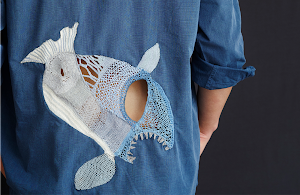 Measure ⅔ of the back piece and cut it into two pieces. 2. 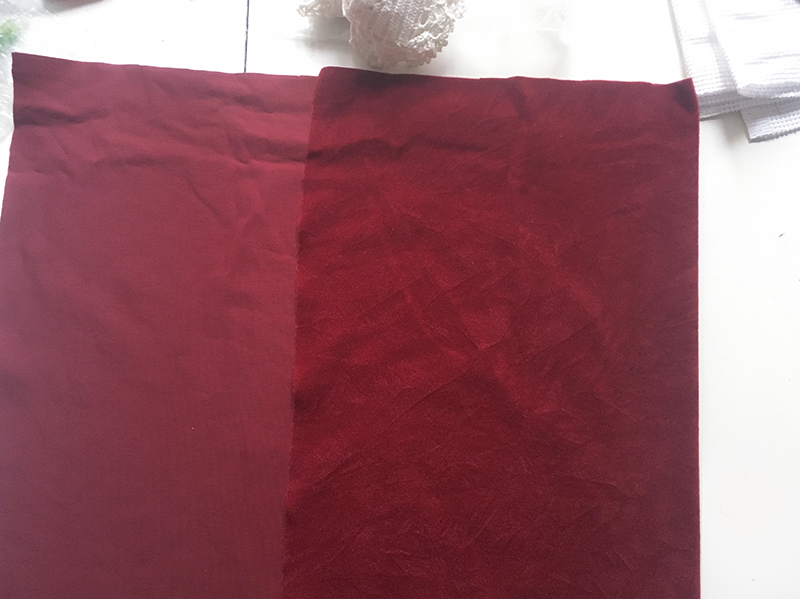 Fold the short sides opposite each other ( 4 cm on both sides) , iron and pin. Stitch two straight lines to keep the opening structured. 3. 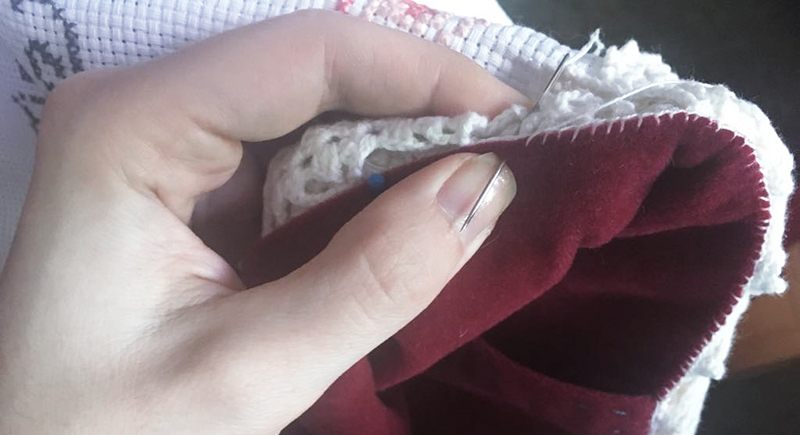 Always press your fabric before stitching parts together. 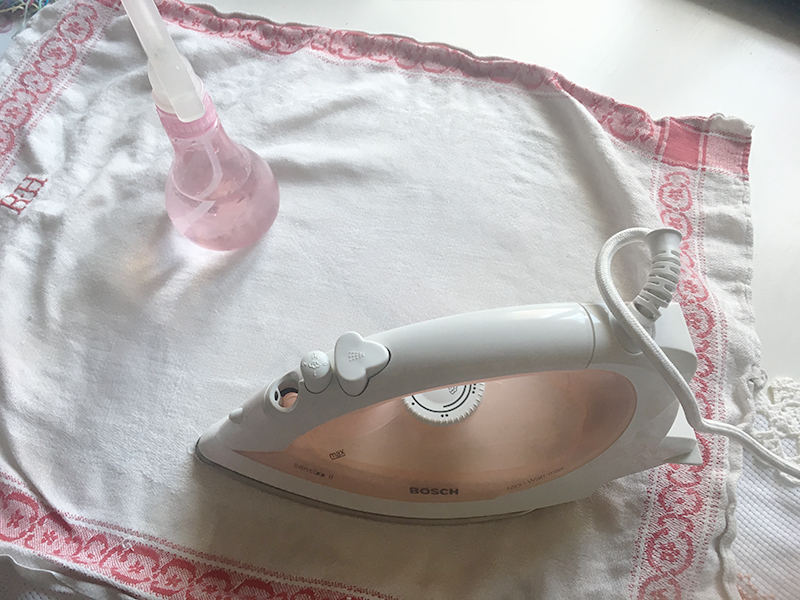 To press: put a towel over the selected area, moist the towel and then iron. 4. 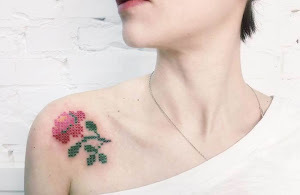 Place the lace around your embroidered design. 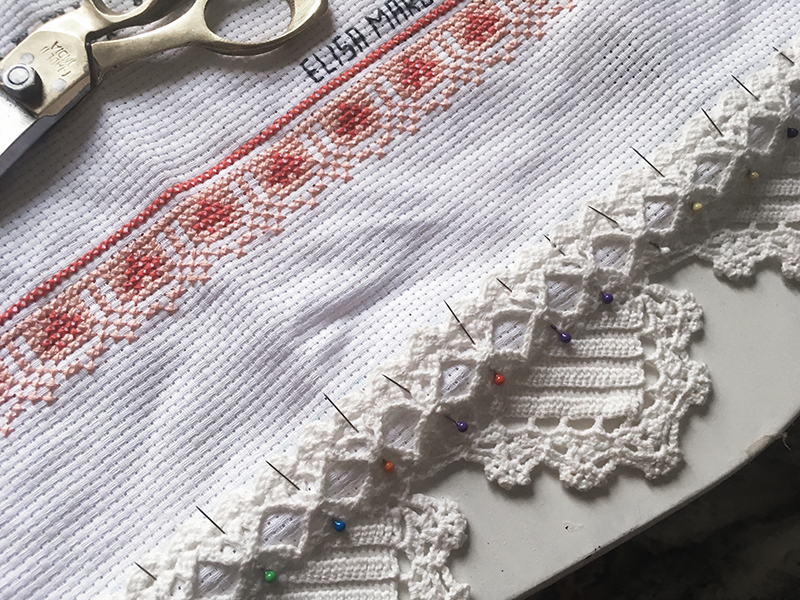 I chose to make to rows of lace to get a really lacy outlook. Iron the lace and pin it down. Be sure to leave some cm in the margin of your canvas so you will be able the mount the back piece with the front piece. 5. 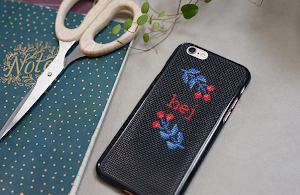 When you are finished with attaching the lace at your canvas you place the back piece against the front piece, both reversed sides against each other. Fold the edges and pin them together. Do not forget to iron :). 6. 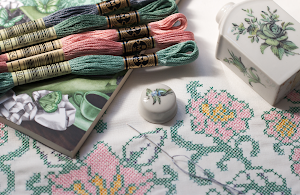 I chose a thread in the some colour of the lace and blanket stitch to sew the parts together. 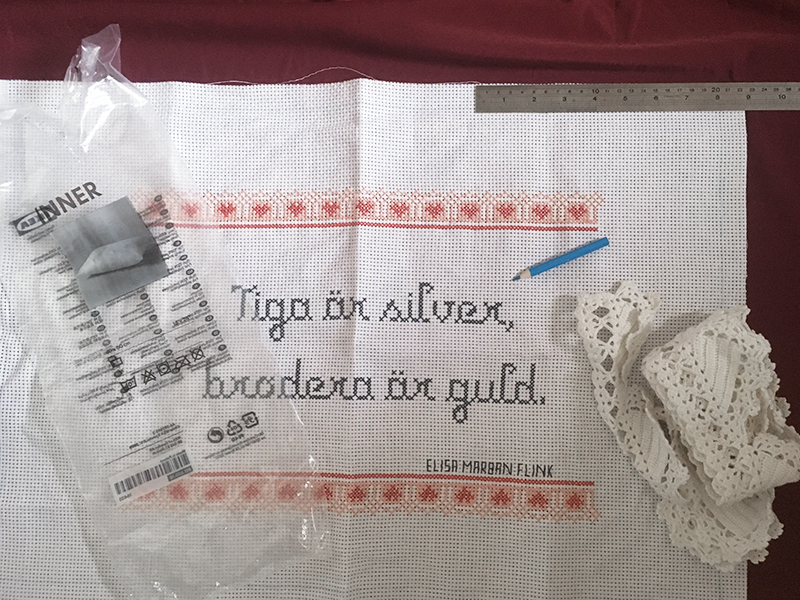 ( Translation of the Swedish quote "Silence is silver, embroidery is gold").